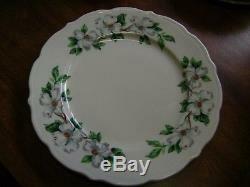 SYRACUSE RAILROAD CHINA WITH DOGWOOD PATTERN. 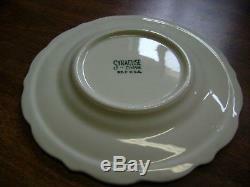 6 DINNER PLATES-9 AND 1/9 INCHES ROUND. 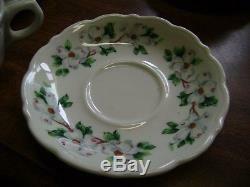 6 BREAD/DESSERT PLATES- 6 AND 1/2 INCHES IN DIAMETER/ROUND. 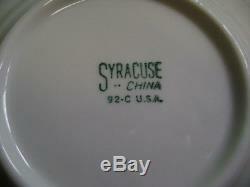 6 CUPS- 4 INCHES IN DIAMETER ADN 2 AND 1/2 INCHES DEEP. 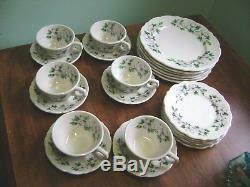 6 SAUCERS- 5 AND 5/8 ROUND. 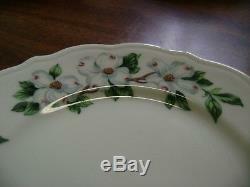 ALL ARE IN EXCELLENT CONDITION- A FEW DINNER PLATES SHOW SOME UTENSIL SCRATCHES, NO OTHER PROBLEMS. NO CHIPS, NO FRACTURES, NO BROWNING. 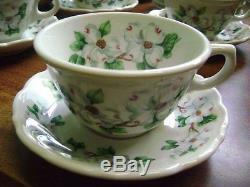 The item "24PC SET FOR 6- SYRACUSE RAILROAD CHINA DOGWOOD PATTERN DINNERWARE SET" is in sale since Friday, February 23, 2018. 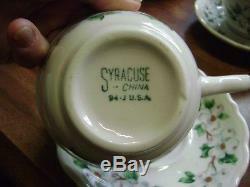 This item is in the category "Pottery & Glass\Pottery & China\China & Dinnerware\Syracuse China". 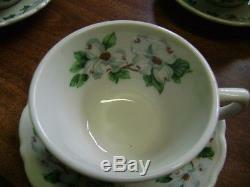 The seller is "pauling1112" and is located in Marshalls Creek, Pennsylvania. This item can be shipped worldwide.